The Uzbek head-dress has always been one of the most popular and widespread types of applied art of Uzbekistan. 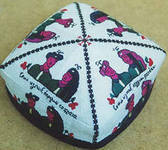 It is a hard or soft cap on the lining. The Uzbek head-dress became an integral part of the Uzbek national costume, came into the life and traditions of Uzbek people. It (from the Turkic "Tube" - top) is not only the national head-dress among the Uzbeks, but also among other Central Asian nations. They are classified by types: men, women, children, for old people. Old women do not wear it. Child's head-dresses (kulohcha, kalpakcha, duppi, kulupush) are colorful fabrics, fluffiness of tassels and beads, embroidery, spangles and lots of charms. The most common forms of Uzbek head-dreasses are- square, slightly conical. They are made of two or more layers of fabric quilted and fixed with a silk or cotton thread. It is usually embroidered with a silk thread, gold or silver cantle. Uzbek women were skilled in the art of embroidery of head-dress. The most common patterns of embroidery include flower motif, almond-shaped motif "bodom" – a symbol of life and fertility. 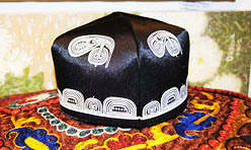 "Ilon izi" (trail snakes) is a widespread pattern in the ornament of uzbek head-dress, it acts as a talisman. Geometric patterns were also popular. Chust head-dress is very popular in many regions of Uzbekistan. Duppi is the most widespread kind of head-dress of the town Chust – it is characterized by a black background and white pattern depicted in the form of four pods of pepper – “kalampir”; the band is embroidered in small arches settled in the row. There are three kinds of duppi – rounded, roundly tetrahedral and the extended up cap. Chust duppis (black background and embroidered white pattern) are remarkable for “slope” of the ornament (full almonds with short and sharply bent tendrils) and a significant height of the band. The motives of other kinds of tyubeteikas in Fergana valley – “Sandali”, “Akka ikki sum”, “Chimboy”, “Surkachekma” are common. Samarkand head-dresses are made in the techniques of “piltaduzi”. There are other kinds of head-dresses: Urgut head-dress “kalpok”, Bukhara gold embroidery head-dress, Shakhrisabz head-dress “gilam duppi”, Kitab and Shakhrisabz head-dresses “sanama” and “chizma”, “takhya”, “yaykha”, “chumakli”, “kush” – men and women Khorezm head-dresses. The most extended ornaments on the head-dresses were: pattern in the form of pepper (a symbol of purity and estrangement from all earthly), crosses, tufts of feathers, the motif of a nightingale, a bird (a symbol of supreme wisdom), branches of a rose (a symbol of peace and beauty), the inscriptions by the holy Arabic type and others.